Note: The clock starts the moment the run begins. Rest exactly 5:00 minutes between each round. Mens prescribed weight is up to 225lb. and women’s 165lb. Set a personal goal to keep your 400 meter split time to 1:45 or less and your AMRAP to 45 Repetitions or 3 rounds. The last time this workout was performed in our gym was June 13, 2014, and everyone agreed it was physically and mentally very challenging. Rest up and get ready for a good one! Alyssa is Athlete of The Week! 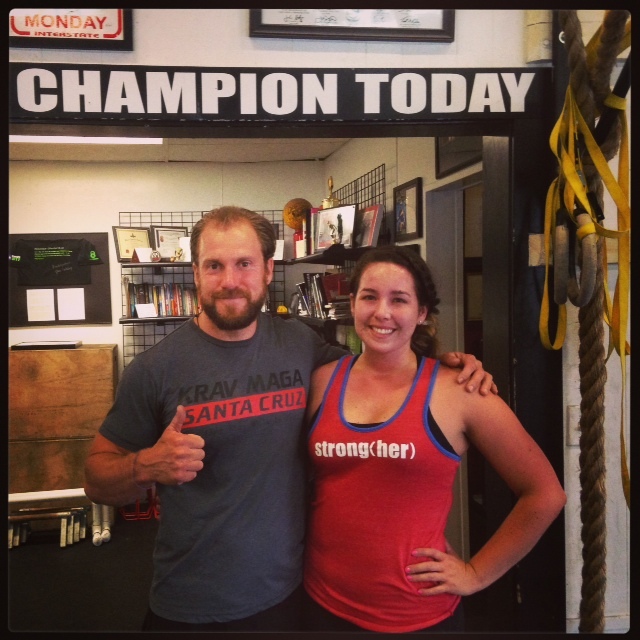 Special congratulations to Alyssa on being recognized as Athlete of The Week at CrossFit Amundson. Alyssa has been training at CrossFit Amundson for nearly one year with intense focus, determination, mental toughness and attention to technique. She maintains a positive mental attitude in the face of the most challenging workouts and lives by the motto of “Be A Champion Today.” Outside the gym, Alyssa serves her community as a nurse, and is always quick with a smile and word of encouragement. Last week, Alyssa completed her very first “As Rx’d” workout. Congratulations Alyssa on your success and accomplishments and keep up the inspiring work.